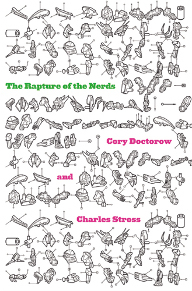 Above, you’ll find links to downloadable editions of the text of Rapture of the Nerds. These downloads are licensed under a Creative Commons Attribution-Noncommercial-NoDerivs license, which lets you share it, provided that you do so on a noncommercial basis. If you’d like to make a remix, please get in touch with us. A word of explanation for this shift is in order. When I first started publishing under Creative Commons licenses, I had to carefully explain this to my editor and publisher at Tor Books. They were incredibly forward-looking and gave me permission to release the first-ever novel licensed under CC — my debut novel Down and Out in the Magic Kingdom. This ground-breaking step was only possible because I was able to have intense, personal discussions with my publisher. My foreign rights agents are the inestimable Danny and Heather Baror, and collectively they have sold my books into literally dozens of countries and languages, helping to bring my work to places I couldn’t have dreamed of reaching on my own. They subcontract for my agent Russell Galen, another inestimable personage without whom I would not have attained anything like the dizzy heights that I enjoy today. They attend large book fairs in cities like Frankfurt and Bologna in order to sell the foreign rights to my books, often negotiating with one of a few English-speakers at a foreign press, who then goes back and justifies her or his decisions to the rest of the company. The point is that this is nothing like my initial Creative Commons discussion with Tor. That was me sitting down and making the case to editors I’ve known for years (my editor at Tor, Patrick Nielsen Hayden, has known me since I was 17). My foreign rights are sold by a subcontractor of my representative to a representative of a press I’ve often never heard of, who then has to explain my publishing philosophy to people I’ve never met, using a language I don’t speak. Danny and Heather have asked — not demanded, asked! — that I consider publishing books under a NoDerivs license, so that I can consult with them before I authorize translations of my books. They want to be able to talk to potential foreign publishers about how this stuff works, to give me time to talk with them, to ease them into the idea, and to have the kind of extended conversation that helped me lead Tor into their decision all those years ago. And I agreed. Free/open culture is something publishers need to be led to, not forced into. It’s a long conversation that often runs contrary to their intuition and received wisdom. But no one gets into publishing to get rich. Working in the publishing industry is virtually a vow of poverty. The only reason to get into publishing is because you flat-out love books and want to make them happen. People work in publishing for the same reason writers write: they can’t help themselves. So I want to be able to have this conversation, personally, unhurriedly, one-to-one. I want to keep all the people involved in my books — agents, subagents, foreign editors and their bosses — in the loop on these discussions. I will always passionately advocate for CC licensing in all of my work. I promise you that if you write to me with a request for a noncommercial derivative use, that I will do everything in my power to see that it is authorized. Strip away the legalese and what that says is, “Copyright gives you, the public, rights. Fair use is real. Fair dealing is real. De minimum exemptions to copyright are real. You have the right to make all sorts of uses of all copyrighted works, without permission, without Creative Commons licenses. Rights are like muscles. When you don’t exercise them, they get flabby. Stop asking for stuff you can take without permission. Please! The PDF link is missing the “pdf” extension from the URL. Need to add the .pdf extension to the url. Keep up the good work. Looks like the PDF link is fixed. I’ve also e-mailed Cory an epub file so hopefully it’ll be posted soon for those looking for a more ereader-friendly format. The MOBI link doesn’t seem to be working. Thanks for doing this. This will be the first book of yours I’ve read and honestly can’t afford it otherwise. If I enjoy I’ll purchase others. Thank you both ! I also bought the hardcopy, you know, for the shelf, if the first godlike AI will … wait, has this already happened ? I’m not sure if this was introduced in the conversion or not. Just a few pages in, and it looks like fun! Thanks — fixed and uploading now! Off-topic: do you use revision numbers for versioning your manuscripts, or dates? “Before he can jerk free, the instrument bush hovering over him has scraped a layer of skin from his forearm and drawn a few cmililiters of blood from the back of his hand, leaving behind an anesthetized patch of numb skin”. Sorry I missed you guys at the Brooklyn Maker meetup earlier this month. I thought it only polite to say thank you for giving me your new book. Was raving at the pub just yesterday about the Stross/Doctorow/Bacigalupi axis – to another P2P/Open Source luminary (@jdaviescoates) and as if by magic you give me a present today. Hey, Gerard. As the instructions clearly state, the cover image may not be included in these downloads, as I don’t have the rights to it. Giuliani. Hanging judge and reality show host. Thanks for the CC version Cory. Once the donation site is live I will donate a hardcover version to the closest library/school. Interesting typo in the fine print commercial interlude. It says you are free to distribute it far and wide as long as you are NOT doing it in a NON-commercial manner.. This was faithfully translated from the occicial html to the epub version (and I assume the other versions). *official*. Of course, I would make a typo in a post about a typo.. The link to the .txt version is broken. Simply remove “_kindle” from the url and it works just fine. Thanks for sharing. I buy a lot of your books for the library that I work at. It’s great of you to also make them freely available in this way. Thank you, Roy! Give Tor my best.